In 1960, the seaside village of Kapoho on the Puna Coast was buried in lava during an eruption of Kilauea Volcano. The laughing voices of children were quieted, and the families, whose memories reached back for decades there, were dispersed. Author Frances H. Kakugawa was one of those children of a Japanese-American family. She has woven a poignant, coming-of-age memoir decades until today, when only memories remain. 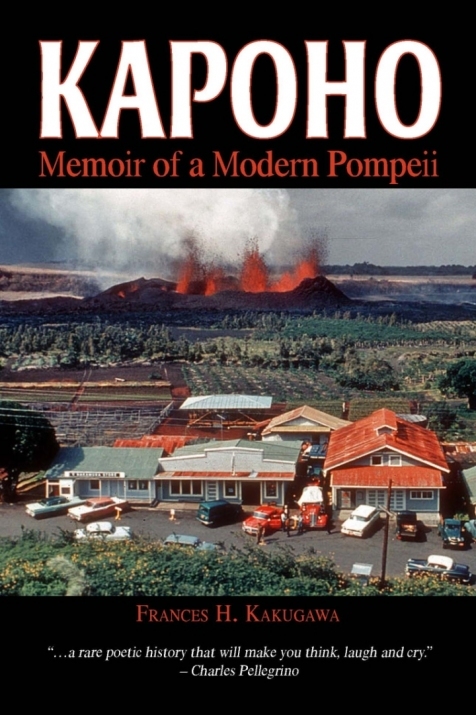 these are a few excerpts from her most recent book, Kapoho: Memoir of a Modern Pompeii, published in 2011. 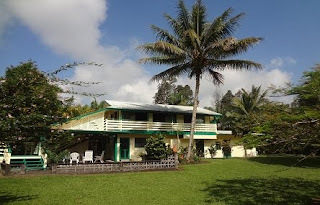 Fire goddess Pele was venturing out in a creep, like spilled olasses, toward the village of Kapoho, a small, quiet, peaceful plantation village, thirty miles east of Hilo. A pungent, rotten-egg-like sulfur stench combined with the smell of burning wood floated ove rKapoho on gray wisps of smoke, raining black ash over cars, over rooftops and on windows. The village, like dice in a gambler's hand, shook and rattled. The lava flow burned everything in its path, slowly and with excruciating efficiency - sugarcane, ohia and guava trees - feeding its red, hungry mouth as it crept toward Kapoho. My grandmother's house a lone sentry a few miles from the village, stood next in line. My grandmother - or Oba-ban, as I called her - stood on the porch of her house, which rose six concrete steps from the ground. She saw shapes like Rorschach inkblots in red, shooting up into the sky, mor than ten miles away. She didn't see any refleted danger in other faces. Instead, she shouted to my uncle, "I can see the lava so clearly from here. Tashika mon." She didn't know that what she was calling "spectacular" was going to cover her house in less than twelve hours. the 1960 Kapoho eruption is described in detail, with photos, on the U.S. Geodetic Survey's Hawaiian Volcano Observatory web page. 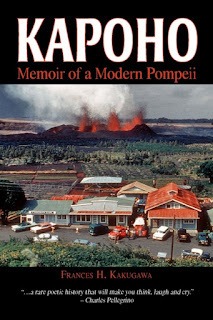 "Kapoho" is available at local bookstores, including Basically Books and Book Gallery in Hilo; Kona Bay Books and Kona Stories in Kona; Big Island BookByers in Pahoa and also online, both at Amazon.com and at bookshawaii.net. Frances Kakugawa is reachable on Facebook at www.facebook.com/FrancesKakugawa.